Celebrate the life of a departed friend or family member with an exuberant and patriotic bouquet of red, white and blue flowers. Comforting memories of a life lived in service to the country are bought to mind. Perfect for floor or tabletop display at a wake, for an altar or in a sanctuary at the funeral or to send to the home of grieving family and friends. 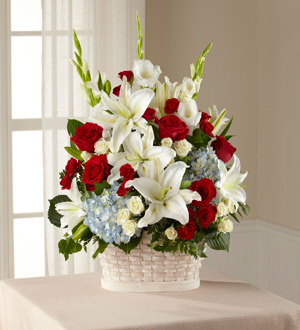 Red And White Roses, White Gladioli (When Available) And Oriental Lilies, And Blue Hydrangeas Beautifully Arranged In A Simply Lovely White Woodchip Basket. 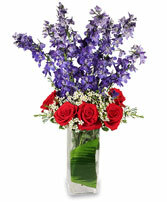 Delphinium, Carnations, Mini Carnations, Lilies, Greenery. 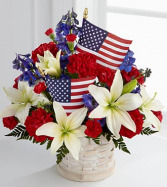 The American Glory™ Bouquet bursts with patriotic pride and heartfelt beauty. Blue delphinium, bright red carnations and mini carnations, and brilliant white Asiatic lilies create a spectacular display arranged amongst American Flags in a round whitewash basket, creating a lovely way to celebrate the summer holidays. BETTER bouquet Approximately 18"H x 14"W.